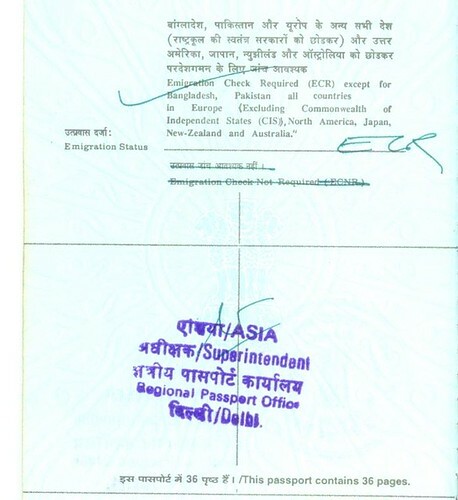 The Ministry of Overseas Indian Affairs (Emigration Policy Division) have allowed ECR passport holders travelling abroad for purposes others than employment to leave the country on production of valid passport, valid visa and return ticket at the immigration counters at international airports in India w.e.f. 1st October 2007. United Arab Emirates (UAE), The Kingdom of Saudi Arabia (KSA), Qatar, Oman, Kuwait, Bahrain, Malaysia, Libya, Jordan, Yemen, Sudan, Afghanistan, Indonesia, Syria, Lebanon, Thailand and Iraq. For all passports issued before January 2007, a blank second page in the passport means your passport is endorsed with ECR and you need to get emigration clearance if you are travelling to any of the above 18 countries for employment. For all passports issued after January 2007, a “Blank” page 2 on your passport is deemed to have been ECNR endorsed. If you don’t fit into ECNR eligibility criteria, and Emigration Check is Required, there will be an endorsement in the passport regarding ECR. Income-Tax payers (including Agricultural Income-Tax payees) in their individual capacity, their spouses and dependent children below the age 18 years. You have either to get the entire ECR stamp deleted, or if your are not eligible (categories listed above), you may get a temporary Emigration Suspension before leaving India. If the applicant does not have Non-ECR status then All such ECR passport holders need to obtain Emigration Clearance Certificate from the Protector-General of Emigrants, Ministry of Overseas India Affairs. 3RD Floor Putherickal Building, Market Road, Ernakulam. Sir. Pls help me.. my passport ecr o want ECNR but I don’t have 10th marks card. certificate wt I do.sir. Please get emigration clearance done from PoE office if you are not eligible for ECNR status.